The Patrol Leader may easily be the most important job in the troop. He has the closest contact with the patrol members and is in the perfect position to help and guide them. 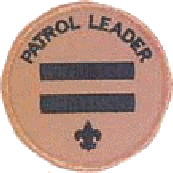 The Patrol Leaders, along with the Senior Patrol Leader and Assistant Senior Patrol Leader are the primary members of the Patrol Leaders' Council.